Developed over the years 1926–1929 at Air Corps Tactical School (ACTS) at Langley Field in Virginia, a forward-looking doctrine of daylight precision bombing was promulgated by Brigadier General William "Billy" Mitchell who advocated a greatly expanded role for the bomber force. After graduating from ACTS in 1931, Mitchell protégée Harold L. George stayed at the school to refine and teach the new bombing theory, soon recruiting as teachers his former students Haywood S. Hansell, Donald Wilson and Laurence S. Kuter as fellow bomber advocates. These four instructors, the core of US bomber advocacy, argued that an enemy's army and navy could be defeated intact due to the destruction of industrial and military targets deep within enemy-held territory. This theory was first espoused by Italian General Giulio Douhet, though his ideas included the terror bombing of population centers that the American theorists eschewed. In contrast, American theorists devised a strategy of pin-point bombing that targeted the enemy economy and the production of weapons. Though unproven, the major attraction of this sort of strategic bombing doctrine was that a war was expected to be won relatively quickly, with minimal casualties, and that grinding, static trench warfare as seen in World War I could be avoided. In November 1932 when British Lord President of the Council Stanley Baldwin said "the bomber will always get through", he was talking about the terror bombing of cities. The US Bomber Mafia agreed with Baldwin only in that the bomber would prevail in its mission. They intended the mission to be against military and industrial targets, not populations. To effect this doctrine, the United States Army Air Corps would be required to expend the majority of its resources in amassing a fleet of self-defending heavy bombers, and in the training and maintenance of a great number of airmen to fill aircrew and ground crew positions. The ACTS officers who believed in the heavy bomber doctrine realized that any other Air Corps expenditures such as for tactical bombers and fighter aircraft would take away from the proposed large fleet of heavy bombers. Moreover, the men realized that the United States government would have to reduce funding to naval and ground forces in order to establish a great air fleet. To implement these changes, the ACTS instructors began to instill a sense in their students that a separate and independent air arm of the type described earlier by Mitchell, to be called the United States Air Force, was the way forward. 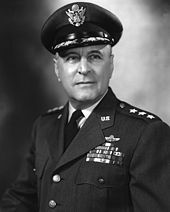 As a compromise first step, the General Headquarters (GHQ) Air Force was established within the Army Air Corps in 1935, commanded by General Frank M. Andrews, a strategic bombing advocate. 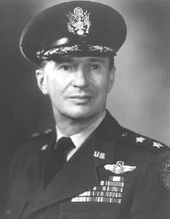 Andrews staffed the command with like-minded officers such as Henry H. "Hap" Arnold. Although flawed and tested only under optimal conditions, the doctrine (originally known as the "industrial web theory") became the primary airpower strategy of the United States in the planning for World War II. 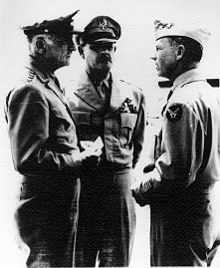 Members of the "Bomber Mafia" produced the two airpower war plans (AWPD-1 and AWPD-42) that guided the wartime expansion and deployment of the Army Air Forces. ^ a b c d e Lee, 1997, pp. 219–220. ^ Griffith, Charles (1999). The Quest: Haywood Hansell and American Strategic Bombing in World War II. Air University Press ISBN 1-58566-069-8, pp. 39–40. ^ Miller, Donald L. (2006). Masters of the Air: America's Bomber Boys Who Fought the Air War Against Nazi Germany, New York: Simon & Schuster. ISBN 0-7432-3544-4, pp. 49–50. ^ Coggins, Edward V. (2000). Wings That Stay On. Turner. p. 1. ISBN 978-1-56311-568-4. ^ Griffith, p.45. Lt.Col. Donald Wilson of ACTS and a "Bomber Mafia" member is credited with the term. ^ Kelsey, Benjamin S. (1982). The Dragon's Teeth? : The Creation of United States Air Power for World War II. Smithsonian Institution Press. pp. 10–12. ISBN 978-0-87474-574-0. ^ "Featured Aircraft" (PDF). Plane Talk: The Newsletter of the War Eagles Air Museum. 19 (4): 1–3, 6. October–December 2006. Retrieved 26 March 2009. ^ Hansell, Haywood S. "AWPD-1, The Process". Air University, USAF. Retrieved 20 August 2009. ^ Belote, Maj. Howard D. (1999). "Warden and the Air Corps Tactical School". Airpower Journal. Air University. Retrieved 19 August 2009.